While the Eyjafjallajökull volcano in Iceland continues to belch ash into the atmosphere and cripple air travel, it's also putting on quite a stunning light show. Follow the links below to see more images of lightening ripping through the clouds of ash above Iceland. Eyjafjallajökull volcano on Sunday" 18 April 2010 [Source: National Geographic]. Such phenomena aren't anything incredibly new, however (nor are they all that surprising when you think about how much material and energy are getting pumped up into the atmosphere). Still, these events can lead to new discoveries. For another cool example, here's a shot taken in 2008 of an eruption in Chile. 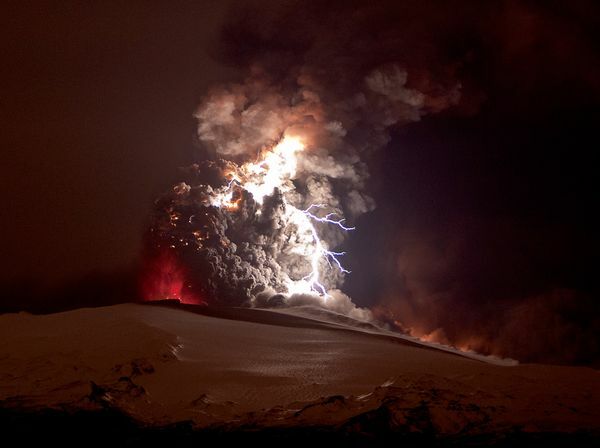 Chilean volcano with lightening ca. 2008. Why is there lightning in the volcano's ash cloud? While it appears the details are still up for debate, it seems the particulate matter could pick up a charge and subsequent separation of particles could set up enough potential to cause (at least short) lightening bolts. I'm speculating here, but I'd imagine it would also be at least in part caused by the same processes that produce lightening in large thunderheads. More of those details can be found in this article from Mother Nature Network.